We’ve been busy improving the Old Farmhouse with rewiring, a shower and an upgraded stove. From time to time we post cottage news on our Facebook page. Guests can post too. In our valley, nature is in charge! See our list of local Cwm y Gerwyn birds through the year. 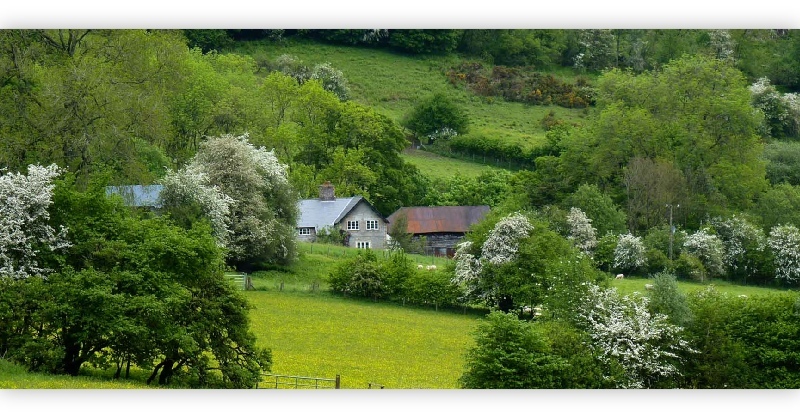 The Lodge and Old Farmhouse cottages in the valley of Cwm y Gerwyn provide a lovely place to enjoy a relaxing holiday in beautiful and unspoiled Welsh border country, at any time of the year. There's lots to do and see in the surrounding countryside. It's also a great place to do nothing - just to enjoy the peace and quiet and freedom to breathe. The Lodge and Old Farm cottages have grown out of an old farm at the head of a secluded valley, built in a sheltered spot above the meeting of two streams. Both cottages have thick stone walls, oak-beam ceilings, traditional slate flagstone floors and slate roofs. They are warmed by woodburning stoves, with additional electric storage heaters. Both kitchens are modern and fully equipped. The Radnor Forest, of which the Cwm y Gerwyn valley is a part, is actually high wild open ground - sheep pastures, outcrops, and moorland - though areas have been reforested in modern times, giving this valley a distinctive landscape. It is excellent country for walking, mountain-biking, horse riding and bird watching. They are normally booked weekly, from Saturday to Saturday. During less busy periods, we also encourage you to book Weekend or Midweek short breaks (3 days or more). You can also book both together, using the connecting door to make a double cottage for a larger group. Well-behaved pets may come too (see our frequently-asked questions). Welcome to Cwm y Gerwyn! What’s on during your stay? This is truly a fantastic getaway stay for anyone looking to disconnect with the world for a while. We had a fabulous time and the house had everything you could need. The cottage is the most cosiest, homely and inviting place i have ever stayed. Lovely walks, right from the door, hours without seeing anyone else. Views are spectacular and always changing throughout the year. Lots of lovely pubs nearby. Local riding stables very good value and excellent care of clients.